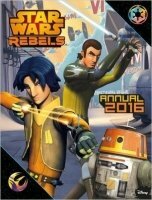 In the exciting new Star Wars Rebels Annual 2016 you will join Ezra, Hera, Kanan, Zeb, Sabine and their grumpy droid, Chopper, as they soar into adventure aboard their custom starship, Ghost. The small band of rebels welcome newcomer Ezra, before setting off on a mission to save some Wookiees from the evil Empire. Includes all new activities, posters and stories from the latest edition to the Star Wars universe.